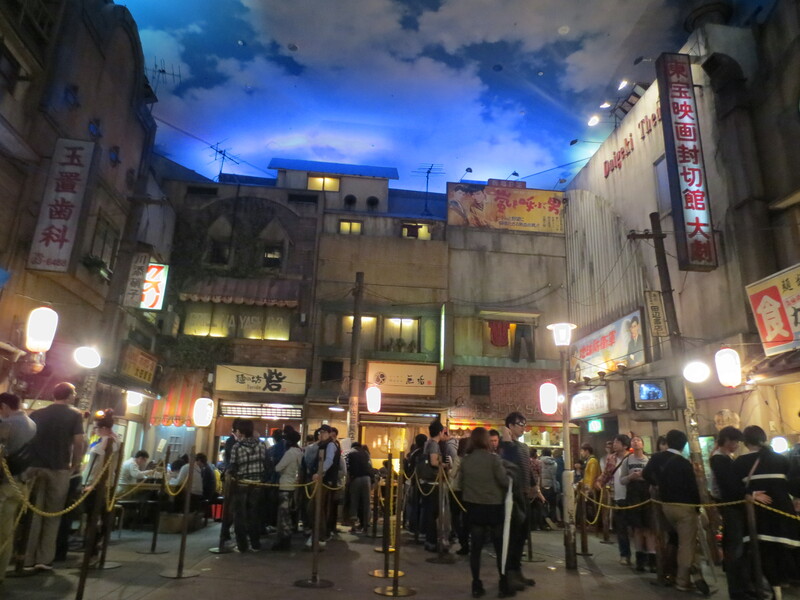 A couple of years ago I read about a ramen museum in Yokohama and added it to my 2013 Japan itinerary. We ran out of time, so put it on our itinerary again in 2014. This time we actually made it! 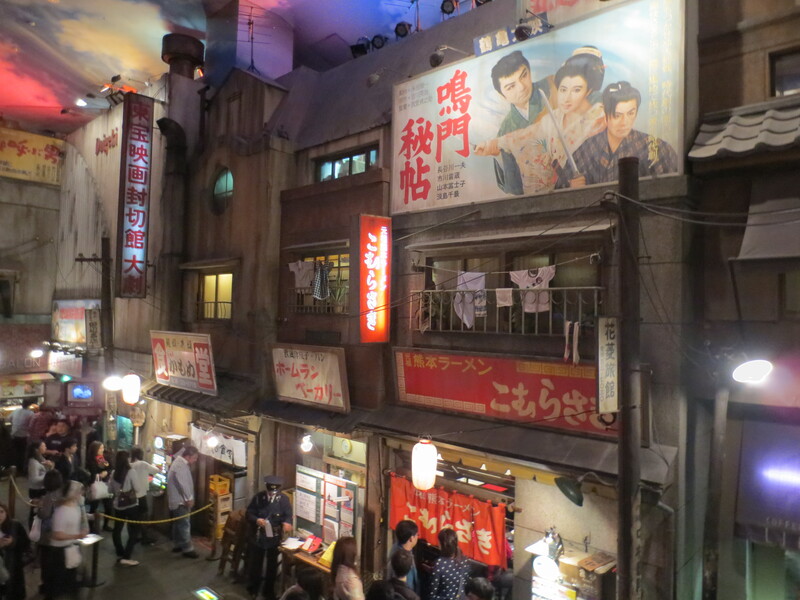 Officially it is called Shin-Yokohama Raumen Museum, but is also referred to as the Yokohama Ramen Museum. 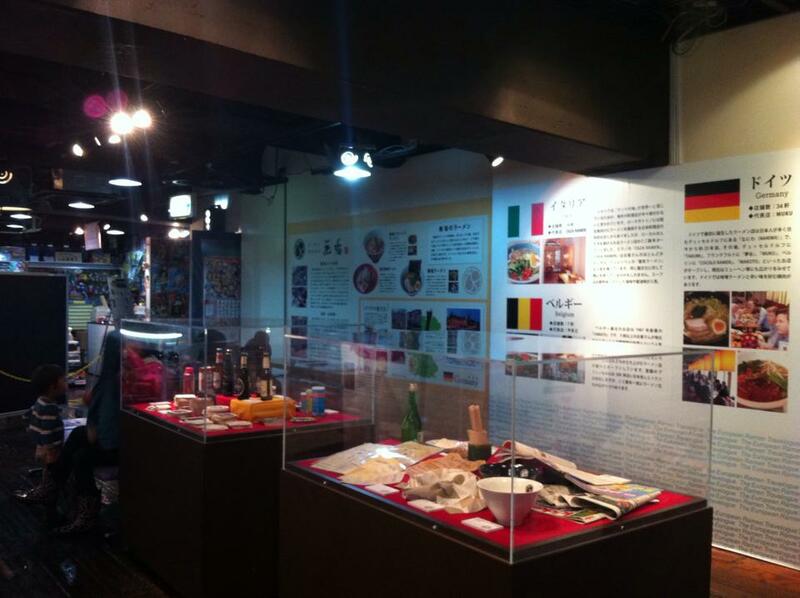 I loved the idea that a country could be so fond of one of its dishes that it would dedicate a whole museum to it. 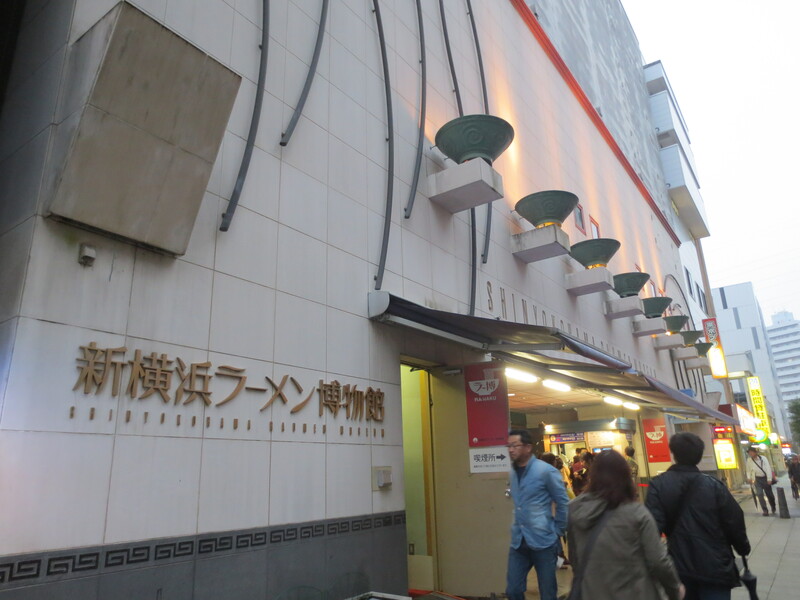 I’d heard that it was really great, and I had images in my mind of a big museum all about ramen, with some food tasting at the end. This sounded like something a little different, I was pretty excited. 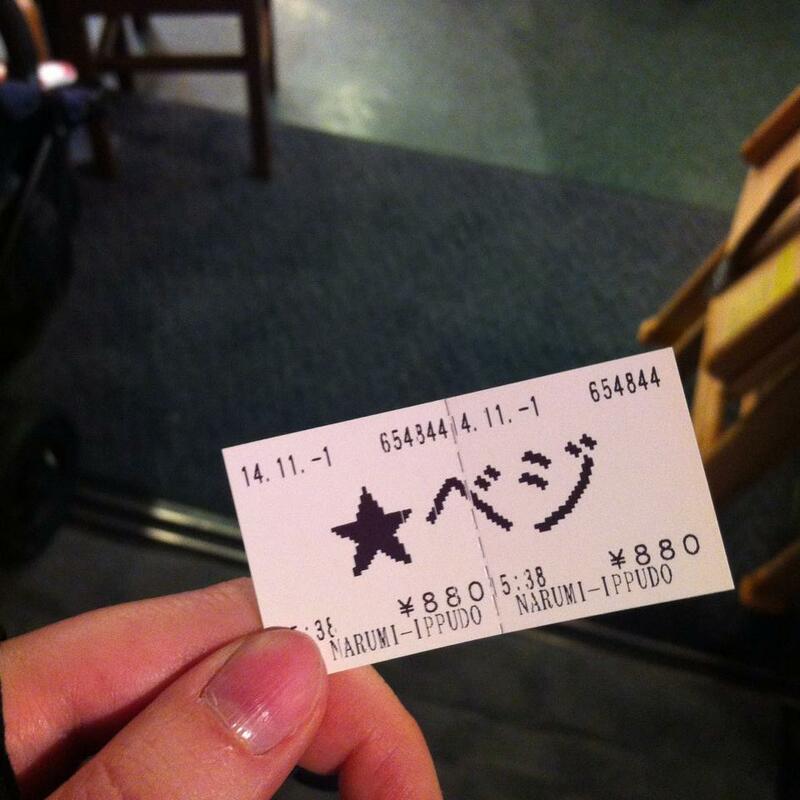 When we got there, we lined up and bought our entry tickets. It was very crowded (this is Japan, after all), mostly with tourists. It wasn’t quite what I was expecting. 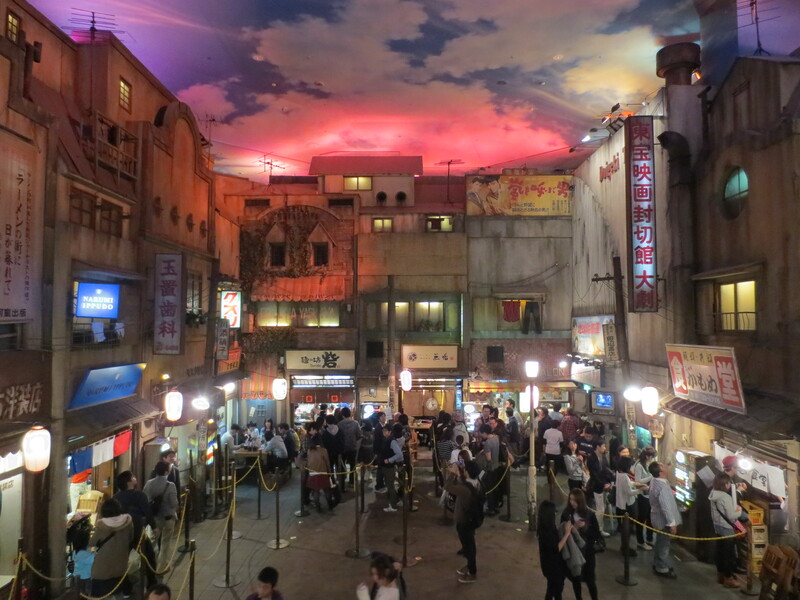 Rather than a museum, it was more a two level food court, decorated to look like you’re outside in village frozen in time. See the man in the police officer/ticket inspector costume below? His job was to look after the queues, and his moustache was drawn on! 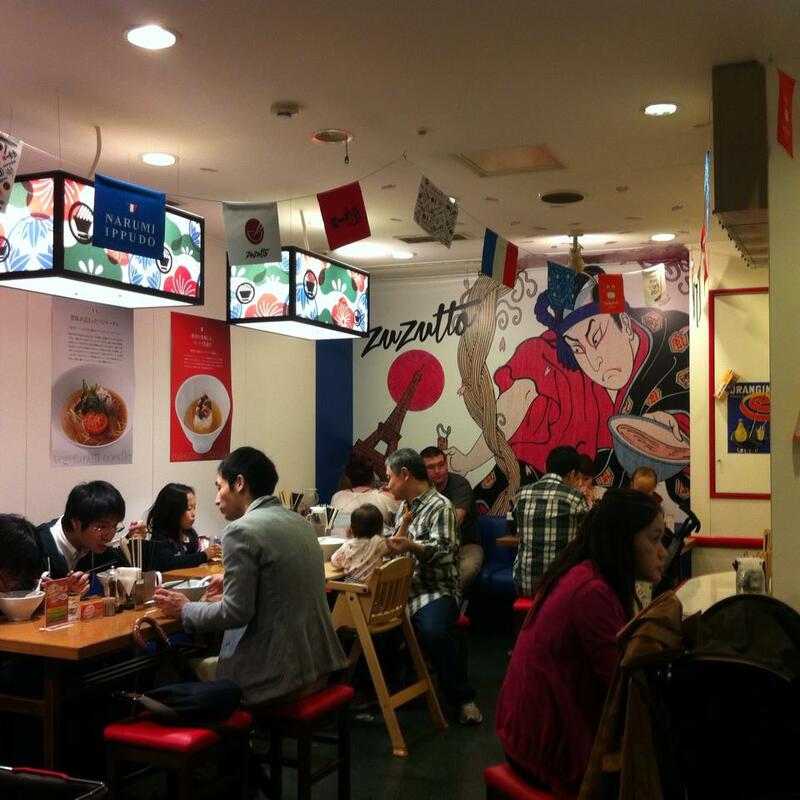 There are a heap of little ramen restaurants within the food court, where you order and pay for your meal at a little vending machine which gives you a ticket to use once you get a seat inside. Adults are expected to order at least one bowl of ramen each when visiting the museum. You can either order a full sized one, or you can order smaller versions – this means that you can try several ramens representing different regions. I think you’d need to allow a couple of hours to do this, as you’d have to line up at each restaurant. 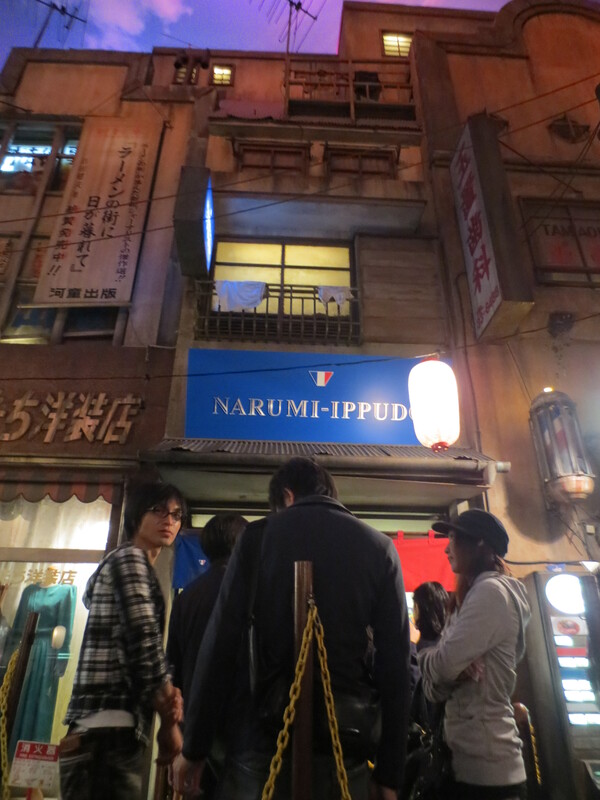 Every little restaurant had a queue outside – and it was a fair bit later than lunch time when we went – so we picked the restaurant with the shortest line at that particular moment, which was Narumi Ippudo. Probably not the best way to choose somewhere to eat, but we had a pretty busy itinerary. I was pleasantly surprised by the ramen from the restaurant with the shortest queue. 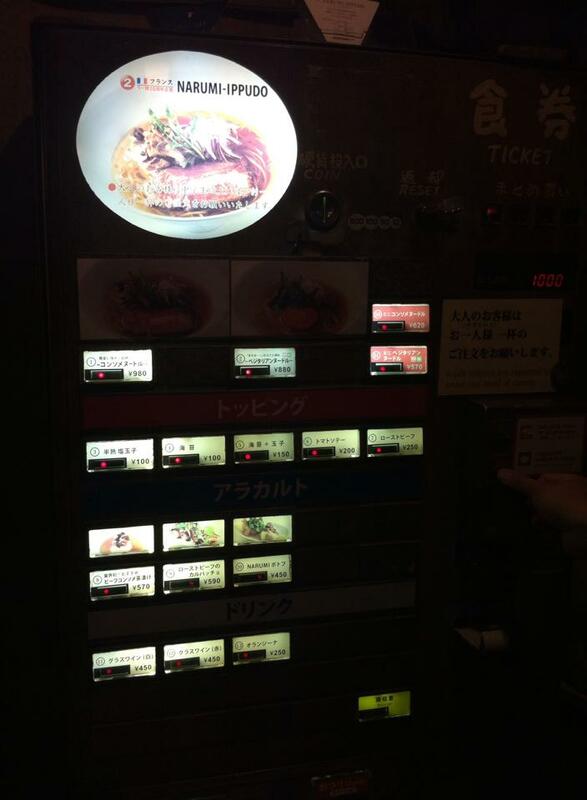 Some of the restaurants have vegetarian options (as shown on a map that they give you when you enter), and when you select your ramen at the ticket vending machine, it can help you to choose this option if need be. I tried a vegetarian one and it was great. 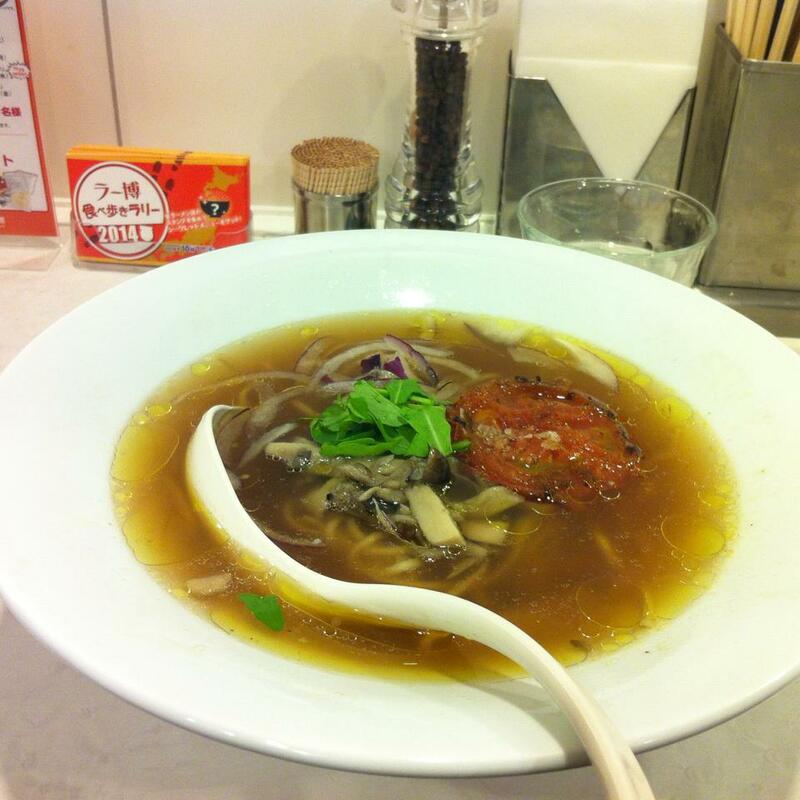 Finding vegetarian food is not always easy in Japan, and finding vegetarian ramen can be an even bigger challenge (even in Australia – which is a pretty vegetarian-friendly country – finding vegetarian ramen is almost impossible), so I was impressed to find a few vegetarian options here. 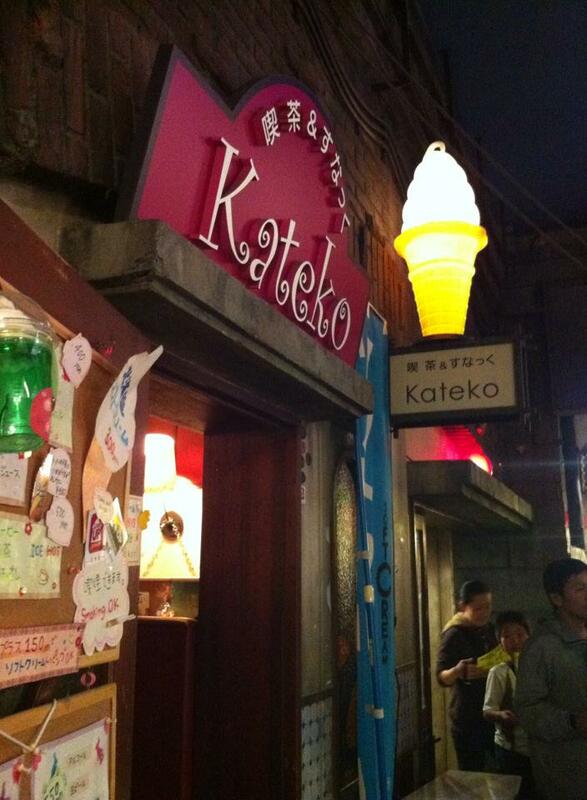 There is also a little ice-cream shop, Kateko. This shop allows guests to smoke inside, and as such it was hazy with smoke. My partner went in and bought an ice-cream which we ate on a seat elsewhere. The Hokkaido soft serve was GREAT. I wish they sold Hokkaido soft serve in Australia! 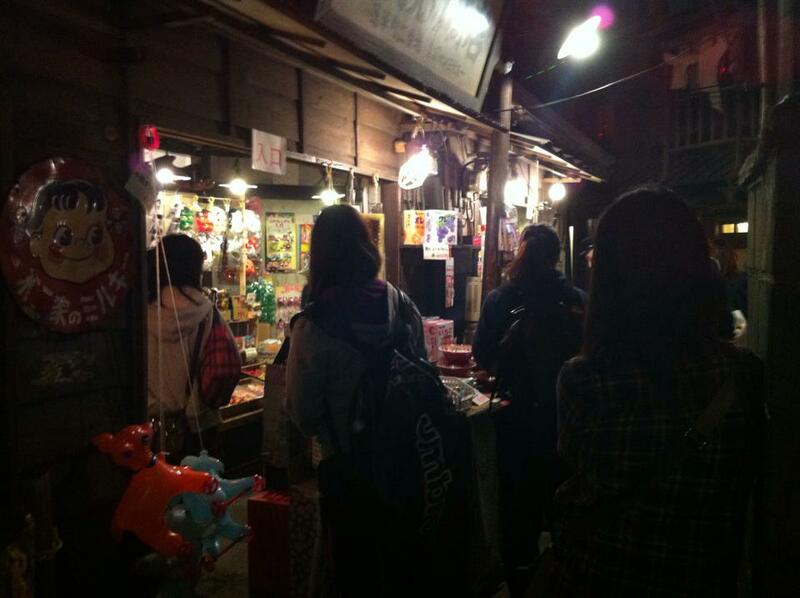 Downstairs you can find a little shop called Dagashi-ya on Yu-yake Shoten (Sunset Shopping Street) selling retro lollies tucked away in a dark corner. I would love to have taken some proper photos of it, but there were signs stating that photos weren’t allowed. 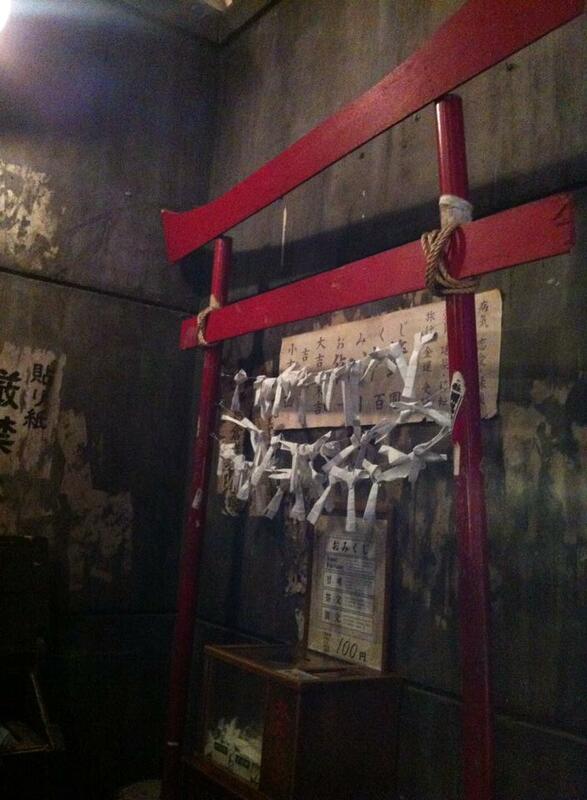 You won’t find a safer dark alleyway than inside the Ramen Museum! After wondering where the ‘museum’ was, we finally found a few displays relating to the history of ramen in the same room as the souvenir shop. 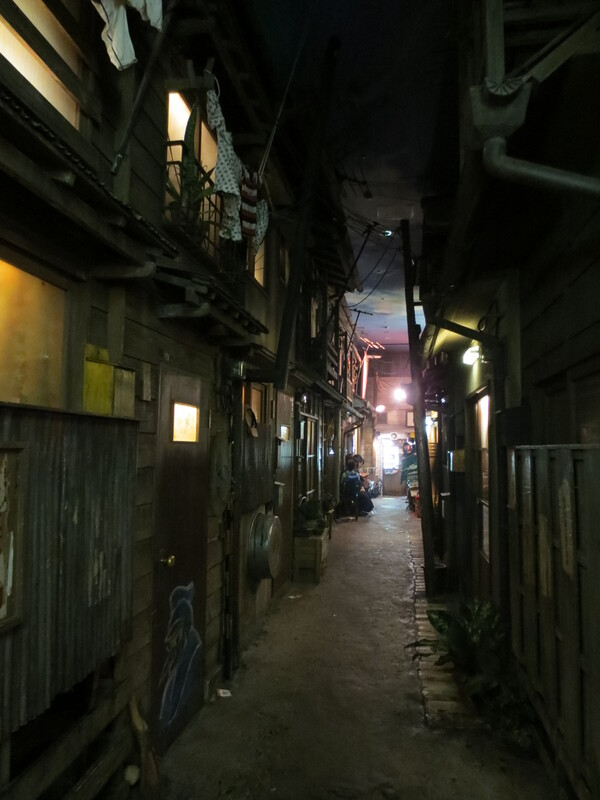 They certainly did a good job making the inside of a building look like an old fashioned town. I did like this aspect of it. As to whether I would recommend it, if you’re looking for something slightly unusual and you really love ramen (especially if you’d like to sample smaller sized ramens that represent a few different regions) then it’s something to consider. Otherwise, it’s a bit of a trek just to go to a glorified food court, but if you’re in the area then I’d suggest checking it out. The entry fee is negligible at 260 Yen. Make sure you get a Hokkaido soft serve! We had trouble finding it, and after a bit of wandering around, went back to the station and asked at the information centre. The helpful staff gave us a brochure (which had a discount coupon for the restaurant, too) and good directions. I wish that I still had the brochure, but when we used it to get a discount on our entry into the museum, they kept the whole brochure. If you get stuck trying to find it, definitely go to the information centre at Shinyokohama Station for help. Next up we’ll look at Robots Unrivalled, the Shinjuku Robot Restaurant show in Sydney, Australia, which has been organised to advertise Contiki’s Japan Unrivalled tour. Watch this space in the coming days for more information and a review of the show!